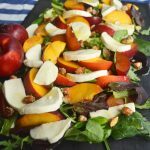 A fresh salad made with spring mix, fresh peaches, plums, honey almonds, fresh mozzarella, all tossed with a sweet vinaigrette. The perfect summer salad! When you think of summer what comes to mind? I think of a lot of things….swimming, vacations, kids home from school. However, the foodie side of me thinks of all of the fruits that are ripe and juicy and just begging to be eaten. There’s nothing like juice running down your chin from the fresh peach you have just picked off a tree. When we first moved to Gilbert, Arizona, we built a home way far out among the vast farm lands. We were one of the first homes to be built in a large community so there was nothing but green fields surrounding us. We would count down the days until Mother’s Day when the peaches would be ripe enough to pick. We would take our straw baskets to the grove of trees down the road and pick our own peaches. They were perfectly plump and delicious. I would pay our money at the tiny little stand, go home and immediately begin making every peach thing I could think of. My house was filled with peach pie, cobbler, and fresh salads. We just couldn’t get enough! I discovered that stone fruits such as peaches, nectarines, plums, cherries, etc. are not just for dessert but are the perfect accompaniment to a summer salad. 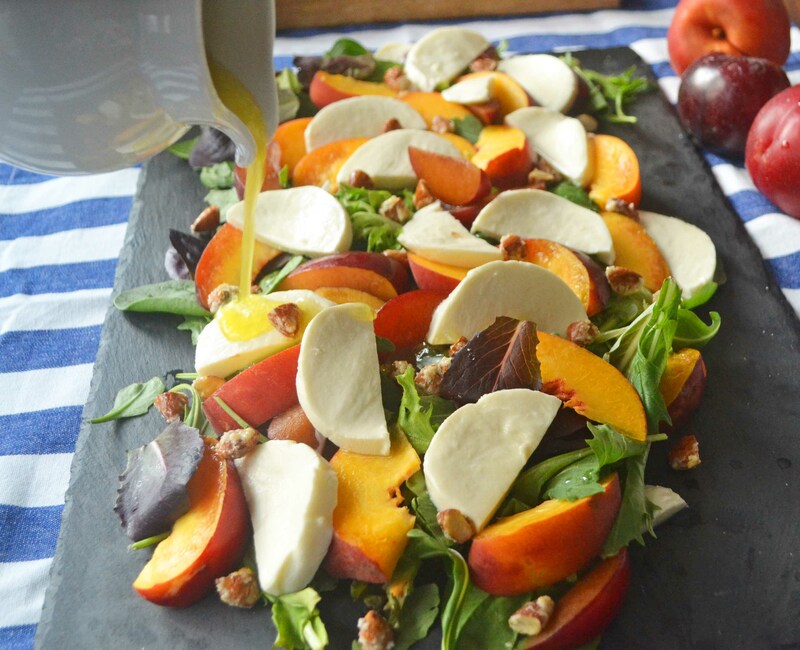 This Summer Peach Fresh Mozzarella Salad is what summer is all about. 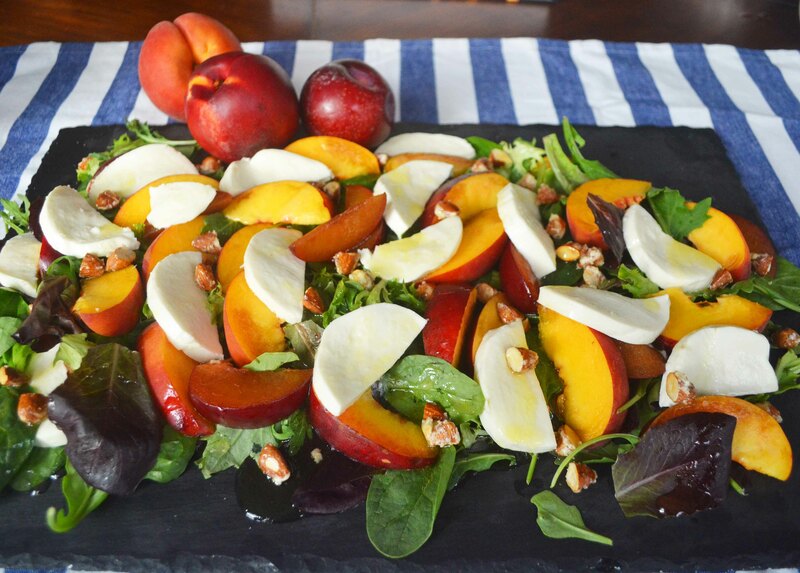 Fresh sweet peaches, crisp nectarines, tangy plums, creamy fresh mozzarella, sugared almonds all on top of bright green spring mix or romaine lettuce. 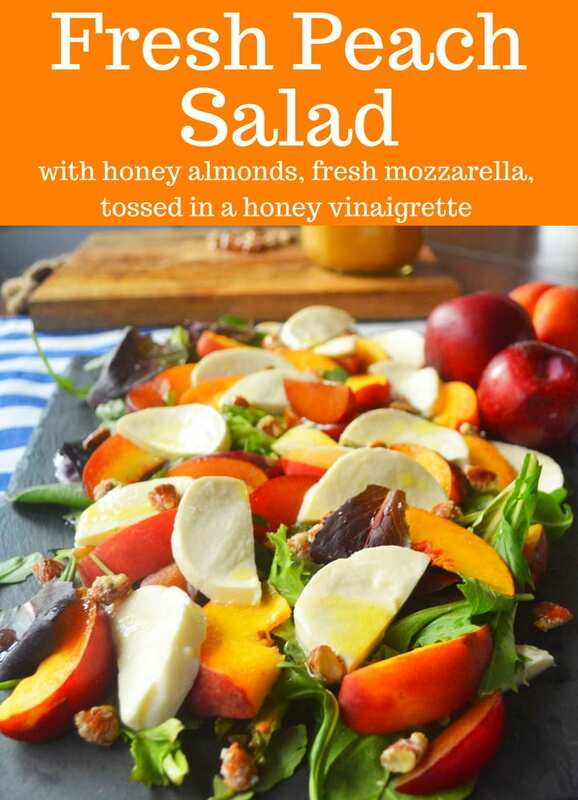 Drizzle some homemade honey vinaigrette on top and you will find yourself in salad heaven! You can use fresh almonds or caramelize them in sugar. Caramelizing gives them a sweet, crunchy coating that pairs perfectly in this Summer Peach Fresh Mozzarella Salad. There are many green options – you can use a spring mix, peppery arugula, or finely chopped romaine. Romaine has the mildest flavor of all of them so it is the most kid-friendly but if you are looking for a grown-up salad, go with spring mix or arugula. I tested it on my guinea pigs (my four kiddos) and they devoured it….even using the spring mix! Use any type of fresh mozzarella from pearls to balls to logs. Costco sells a 2 pack of BelGioioso which is a complete steal. It’s already sliced for you so don’t have to do any work so this salad just got easier! 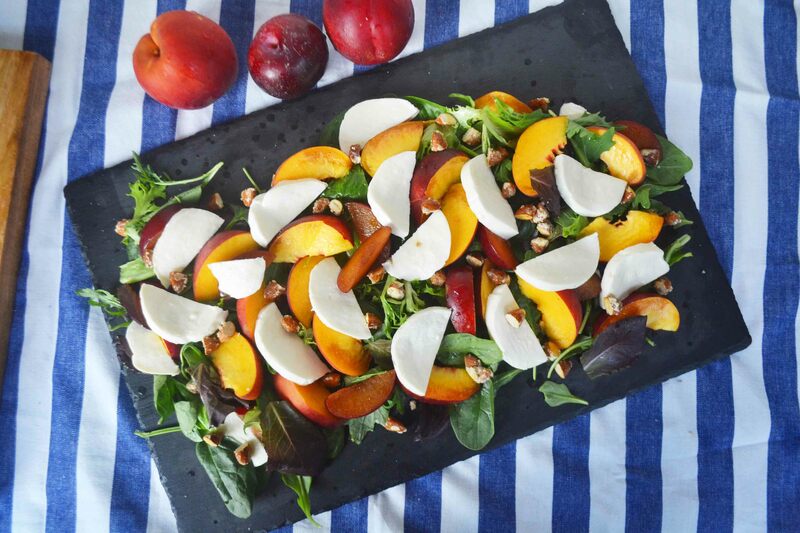 Fresh peaches, plums, and nectarines picked from the tree make the perfect summer salad. Sweet sugared almonds and a honey vinaigrette drizzled on top make this the ultimate salad. Heat small saucepan over medium heat. Add almonds and sugar and let sugar melt and dissolve over almonds, stirring often. Once coated, remove from heat and place on waxed paper. Spread out so the almonds don't clump together. In a small bowl, mix olive oil, vinegar, honey, and salt to taste. 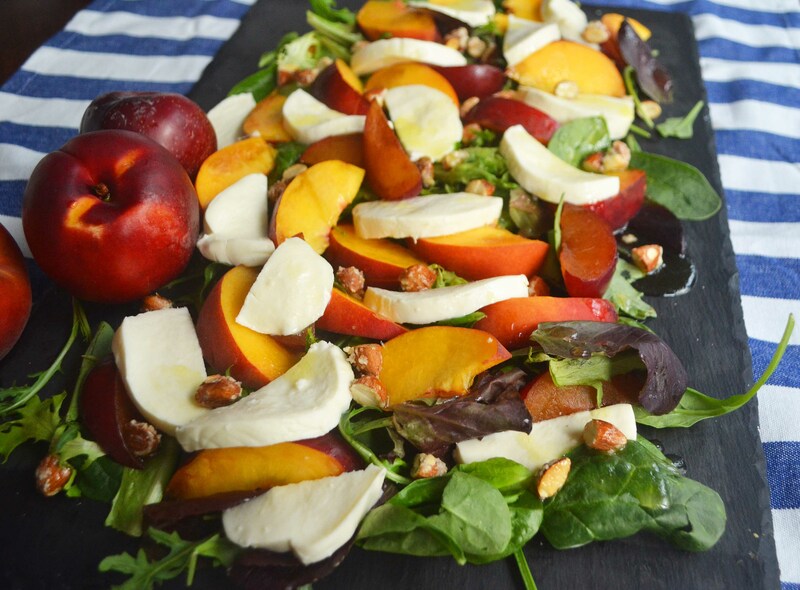 On large platter or bowl, place greens, peaches, nectarine, plum, fresh mozzarella, and almonds. Sprinkle sea salt over fresh mozzarella (optional). Serve with honey vinaigrette. 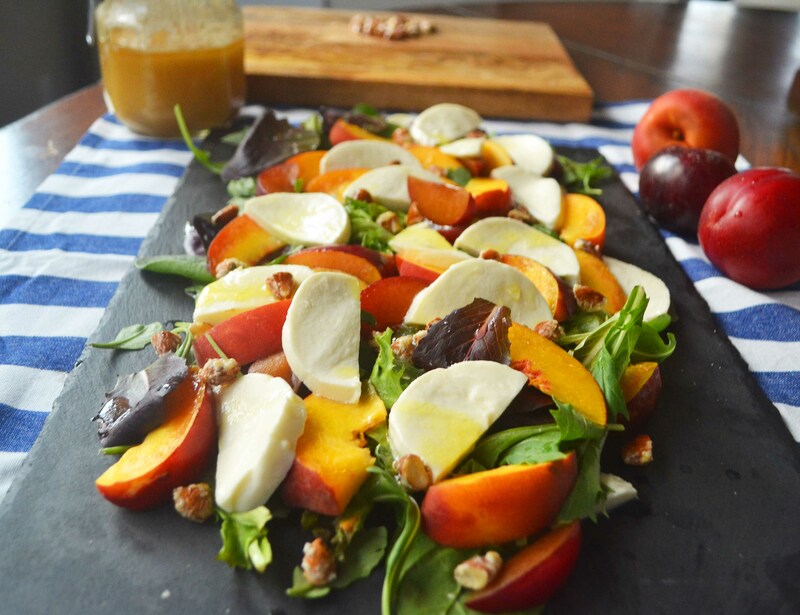 Now go climb up and pick some fresh stone fruit off of a tree and make this Summer Peach Fresh Mozzarella Salad with Honey Vinaigrette. Hope everyone is having a fabulous summer! I would LOVE to hear from you so let me know if you try out one of Modern Honey’s recipes. Tag me using #modernhoney on instagram @modern_honey. We spend half our time in Phoenix Az and in Yachats Oregon. If we are home during the season we go to the Schnepf farm. Beautiful salad. Made this when we had company for dinner. So delicious! I made the base of the salad as written, but added in craisins, bacon, and drizzled on a few drops of Trader Joe’s balsamic glaze (which I could drink straight!) to the mozzarella before adding the dressing. It was crazy-good, and beautiful to boot. Even my young nephew and niece liked it. This one’s a keeper!